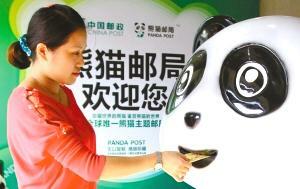 The first Panda Post Office was opened on the Shaocheng Road in Chengdu Yesterday. It’s not just a post office decorated with all panda-elements. According to the Chengdu Municipal Post Office, the other five Panda Offices in Jinli, Wide and Narrow Lanes, Sichuan University, Huanglongxi Ancient Town and Shuangliu Airport will be opened this year. The Panda Post Office has its own post code and stamps. The post code is 610088 and there are six kinds of daily stamps that look like six pandas in different shapes. Each stamp in the above six Panda Post Office has its unique panda stamp.